An Assistant Store Director supports and takes responsibility for overall store management, working alongside the Store Director, these assistants disperse various levels of responsibilities such as training the staff, keeping stock of inventories, maintaining supplies, serving customers, monitoring in-flow and outflow of stocks from the stores, displaying products, promoting sales, writing reports and monitoring competitions. 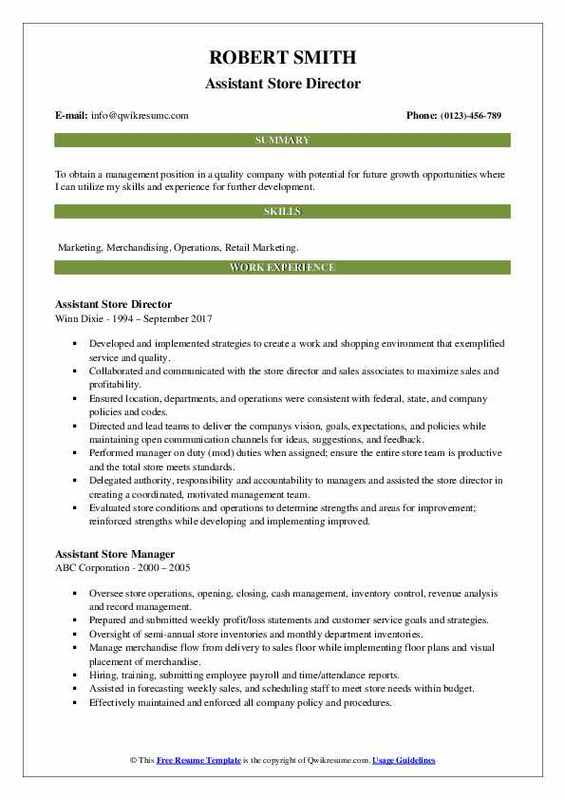 The other important tasks include assisting the Store Director in developing strategies to expand business and customers, administering store activities and maintaining store conditions and visual merchandising standards. 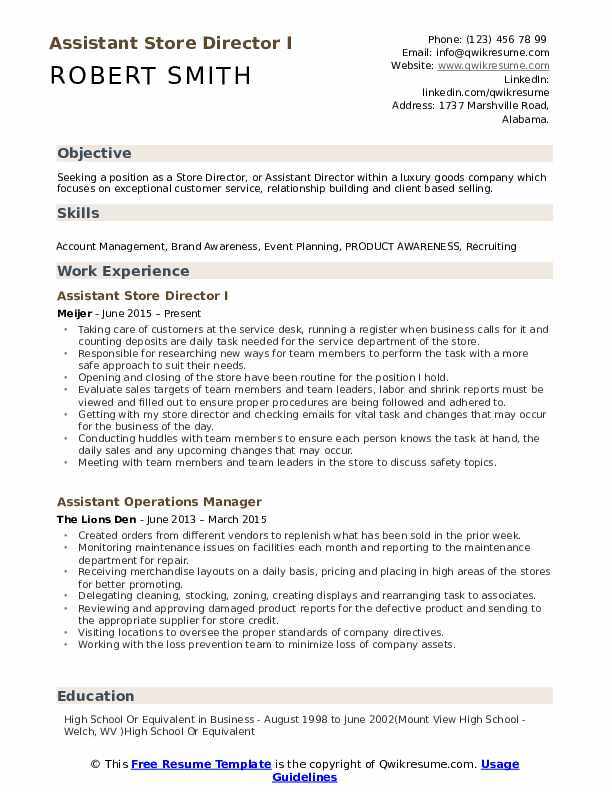 Some of the necessary qualifications that can highlight an Assistant Store Director Resume are excellent commercial awareness, powerful leading skill, customer management skill, fluency in using related applications in systems and strong interpersonal skills. Most of the resumes make a display of a High School Diploma or equivalent for seeking this job position. Headline : Seeking a position as a Store Director, or Assistant Director within a luxury goods company which focuses on exceptional customer service, relationship building and client based selling. Taking care of customers at the service desk, running a register when business calls for it and counting deposits are daily task needed for the service department of the store. Responsible for researching new ways for team members to perform the task with a more safe approach to suit their needs. Opening and closing of the store have been routine for the position I hold. Evaluate sales targets of team members and team leaders, labor and shrink reports must be viewed and filled out to ensure proper procedures are being followed and adhered to. Getting with my store director and checking emails for vital task and changes that may occur for the business of the day. Conducting huddles with team members to ensure each person knows the task at hand, the daily sales and any upcoming changes that may occur. Meeting with team members and team leaders in the store to discuss safety topics. Interviewing and hiring new team members. Giving corrective action to team members to provide a coaching experience to improve with the role they have. Working with the facilities retail administrative assistant to be on top of any inspections that are needed. Getting with team leaders in their departments to provide opportunities that need to be improved on. Scheduling team members for the general merchandise and grocery departments of the store. 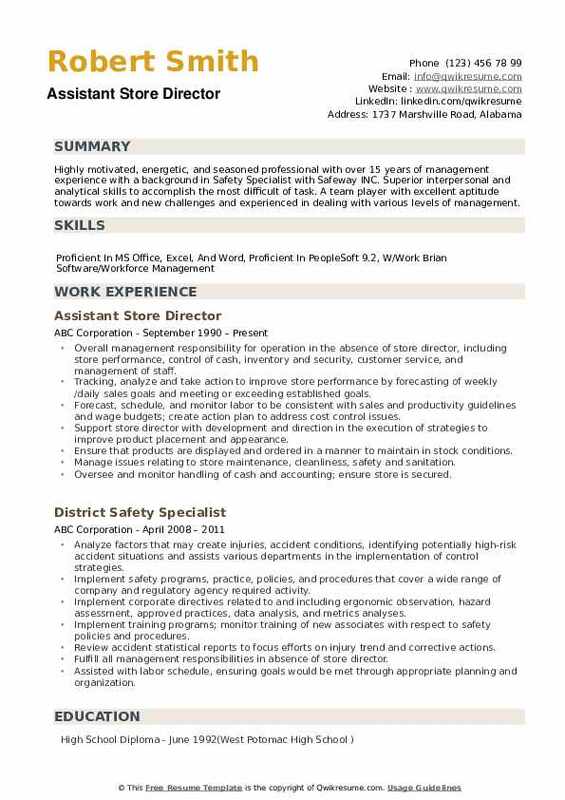 Summary : Assistant Store Director with 24 years experience in the Grocery industry. 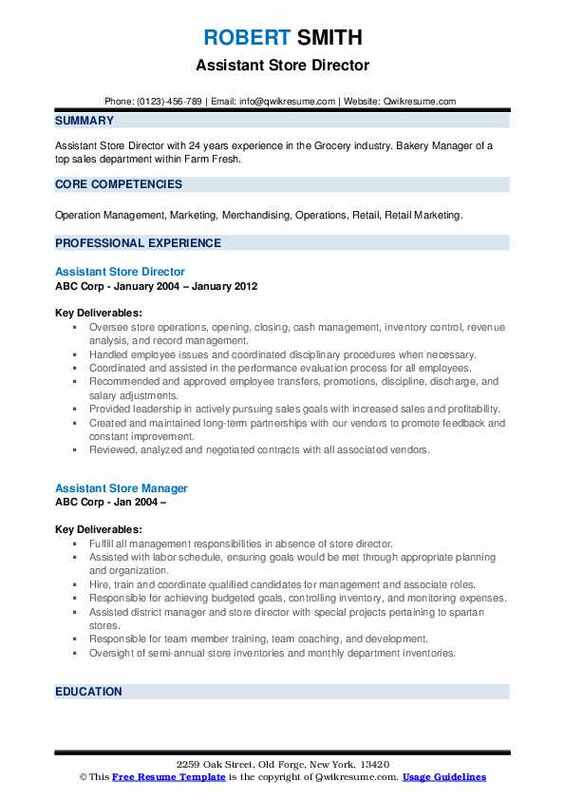 Bakery Manager of a top sales department within Farm Fresh. Skills : Operation Management, Marketing, Merchandising, Operations, Retail, Retail Marketing. Oversee store operations, opening, closing, cash management, inventory control, revenue analysis, and record management. Handled employee issues and coordinated disciplinary procedures when necessary. Coordinated and assisted in the performance evaluation process for all employees. Recommended and approved employee transfers, promotions, discipline, discharge, and salary adjustments. Provided leadership in actively pursuing sales goals with increased sales and profitability. Created and maintained long-term partnerships with our vendors to promote feedback and constant improvement. Reviewed, analyzed and negotiated contracts with all associated vendors. Met with outside sales representatives to determine new items, special purchases, prices and product placement. Controlled costs and provided customers with the best variety, quality, and quantity of goods and services by obtaining the goods and services at the best price. Utilized and analyzed data such as pricing, cost, inventory on hand, time of year and availability to maximize sales, profit, expenses, and product turns for each month. Responsible for approving purchase of supplies, equipment, equipment repair, and service repair. Responsible for approving and negotiating with equipment and service repair companies. Created an atmosphere of cooperation and high employee morale through flexibility and teamwork to achieve goals. Summary : To obtain a management position in a quality company with potential for future growth opportunities where I can utilize my skills and experience for further development. Skills : Marketing, Merchandising, Operations, Retail Marketing. Developed and implemented strategies to create a work and shopping environment that exemplified service and quality. Collaborated and communicated with the store director and sales associates to maximize sales and profitability. Ensured location, departments, and operations were consistent with federal, state, and company policies and codes. Directed and lead teams to deliver the company's vision, goals, expectations, and policies while maintaining open communication channels for ideas, suggestions, and feedback. Performed manager on duty (mod) duties when assigned; ensure the entire store team is productive and the total store meets standards. Delegated authority, responsibility and accountability to managers and assisted the store director in creating a coordinated, motivated management team. Evaluated store conditions and operations to determine strengths and areas for improvement; reinforced strengths while developing and implementing improved. Assisted the store director in managing the fiscal budget, in-stock, inventory and shrink expenses including labor and supply management and cash control with a high level of integrity, urgency and responsibility and within the best interests of the organization. Recruited, interviewed and hired the best-qualified applicants through pro-active and consistent recruitment techniques, within company established compensation. Guidelines; ensure new team members receive proper orientation and training. Conducted orientation sessions to support the delivery of operational information, job-specific requirements, performance standards, human resources programs, and policies, as well as pertinent safety program guidelines for new team members. Ensured adherence to all state and federal employment laws and company policies and procedures regarding team members through the partnership with human resource and legal department support staff. Summary : Accomplished Managerial Professional with knowledge in store operations, employee management which focuses on maximizing employee performance of an employers strategic objectives. Provide counsel and advice to the line and staff management with respect to the proper application of policies, procedures and other accepted human resources practices. Contributes to hiring decisions for line and staff positions within upwards of 18 Jewel-Osco locations. Executes attentive supervision for 180 employees across 18 Jewel-Osco locations, while maintaining excellent customer relations with customers. Responsible for properly identifying and interviewing candidates, while evaluating and recommending for employment those individuals who best meet Jewel-Osco needs and standards. Serves as primary point of contact for new hire onboarding and orientation. Responsible for developing and executing strategic recruiting practices with in-store promotion, as well as recruitment at professional career fairs on the local and national level. Responsible for designing recruiting strategies to successfully fill positions through different sourcing models and full-cycle recruiting methods. Leverage relationships for pro-active workforce planning by understanding Jewel-Osco initiatives and specific store needs. Lead extensive on-the-job training (OJT) including the use of workplace tools, machines, documents, equipment, and other knowledge and skills needed for line employees and potential management employees to perform job duties effectively. Point of contact for maintaining vendor management relationships at several Jewel-Osco locations to ensure proper levels of specified product. Adheres to and manages state and federal compliance standards such as OSHA. 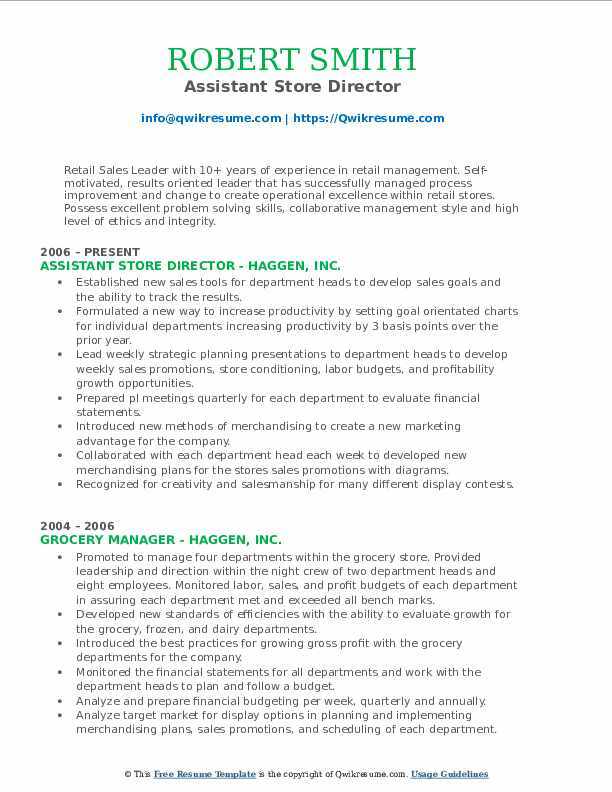 Summary : Service-oriented Assistant Store Director with 19+ years experience in Grocery Retail. Core competencies include Customer Service, Sales, and Marketing, Education and Training, as well as excellent communication and time management skills. 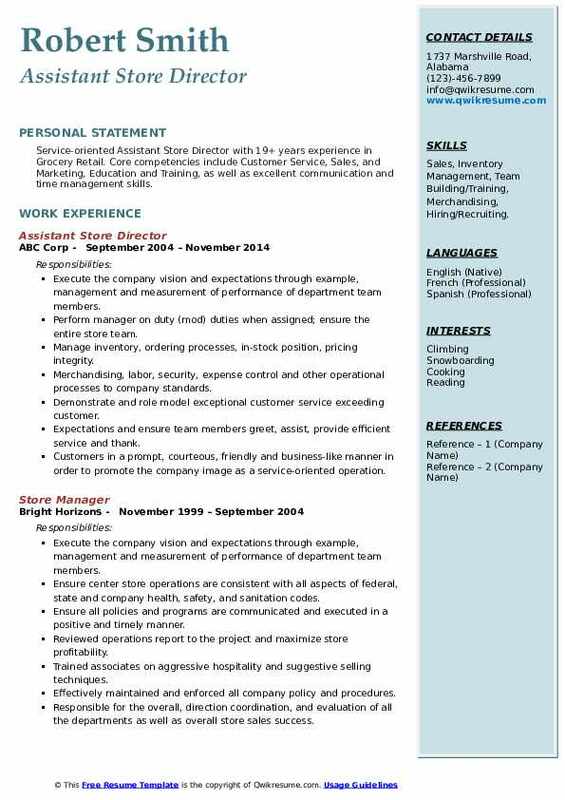 Skills : Sales, Inventory Management, Team Building/Training, Merchandising, Hiring/Recruiting. Perform manager on duty (mod) duties when assigned; ensure the entire store team. Manage inventory, ordering processes, in-stock position, pricing integrity. Merchandising, labor, security, expense control and other operational processes to company standards. Demonstrate and role model exceptional customer service exceeding customer. Expectations and ensure team members greet, assist, provide efficient service and thank. Customers in a prompt, courteous, friendly and business-like manner in order to promote the company image as a service-oriented operation. Ensure each departments signing and merchandising reflects the preferences of the local customer base and overall value message. Recruit, manage, develop, evaluate and retain a team of direct and indirect reports. Train, coach and lead team members on all product processing, customer service. Evaluate department conditions and operations to determine strengths and areas for improvement; reinforce strengths while developing and implementing improved. Coordinate, plan and order seasonal and non-seasonal merchandise as it relates to advertised events and time of the season; lead team members on the effect of the market. Headline : To obtain management position to oversee sales, optimize operations, and manage resources to produce growth in revenue year by year. Award-winning retail-management professional with 20 years of proven, progressive experience in retail management, and have proven experience in customer service, administration, and people management. 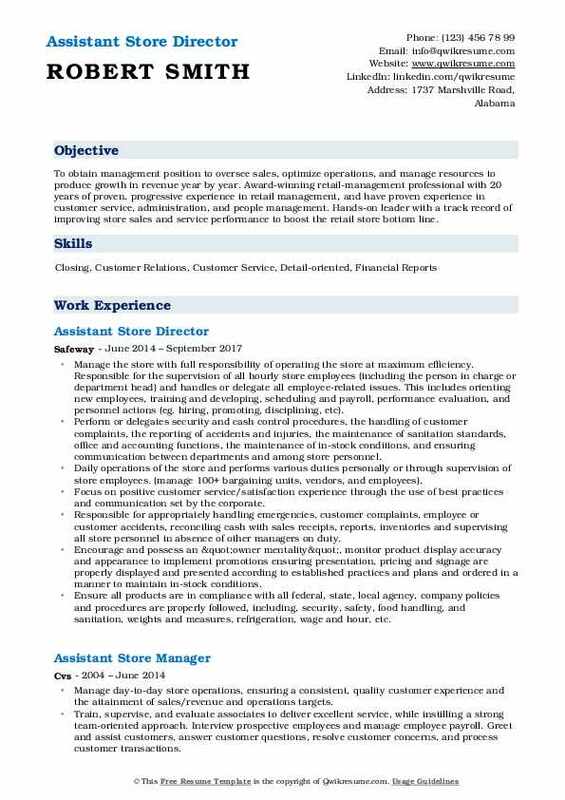 Hands-on leader with a track record of improving store sales and service performance to boost the retail store bottom line. Manage the store with full responsibility of operating the store at maximum efficiency. Responsible for the supervision of all hourly store employees (including the person in charge or department head) and handles or delegate all employee-related issues. This includes orienting new employees, training and developing, scheduling and payroll, performance evaluation, and personnel actions (eg. hiring, promoting, disciplining, etc). Perform or delegates security and cash control procedures, the handling of customer complaints, the reporting of accidents and injuries, the maintenance of sanitation standards, office and accounting functions, the maintenance of in-stock conditions, and ensuring communication between departments and among store personnel. Daily operations of the store and performs various duties personally or through supervision of store employees. (manage 100+ bargaining units, vendors, and employees). Focus on positive customer service/satisfaction experience through the use of best practices and communication set by the corporate. Responsible for appropriately handling emergencies, customer complaints, employee or customer accidents, reconciling cash with sales receipts, reports, inventories and supervising all store personnel in absence of other managers on duty. Encourage and possess an "owner mentality", monitor product display accuracy and appearance to implement promotions ensuring presentation, pricing and signage are properly displayed and presented according to established practices and plans and ordered in a manner to maintain in-stock conditions. Ensure all products are in compliance with all federal, state, local agency, company policies and procedures are properly followed, including, security, safety, food handling, and sanitation, weights and measures, refrigeration, wage and hour, etc. Perform various paperwork including employee evaluations, corrective action plans, job postings and product recalls may be responsible for completing close-of-day function in the office. Travel for training or participation in corporate programs and additionally, travel to other stores to assist when necessary. Determined product lines, maintained inventory levels, managed vendors, designed marketing and sales campaigns, oversaw merchandising and supervised assistant managers and business services team. 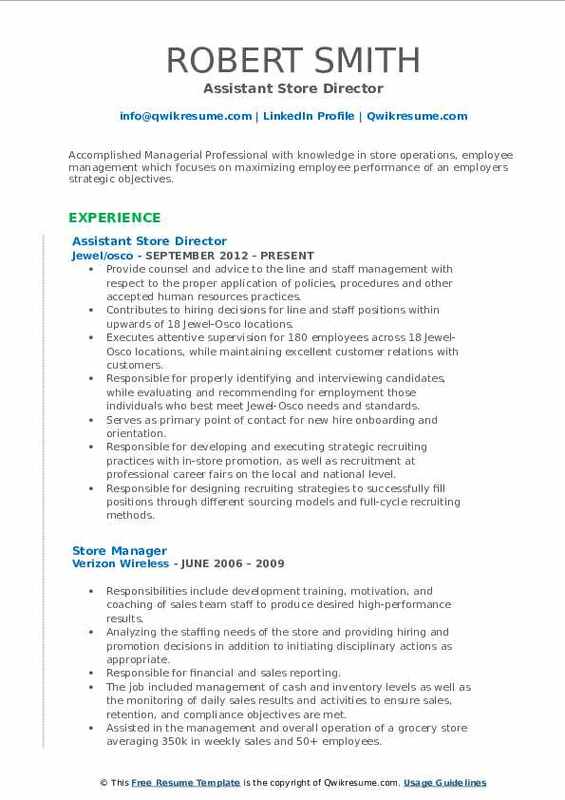 Summary : Retail Sales Leader with 10+ years of experience in retail management. Self-motivated, results oriented leader that has successfully managed process improvement and change to create operational excellence within retail stores. Possess excellent problem solving skills, collaborative management style and high level of ethics and integrity. Established new sales tools for department heads to develop sales goals and the ability to track the results. Formulated a new way to increase productivity by setting goal orientated charts for individual departments increasing productivity by 3 basis points over the prior year. Lead weekly strategic planning presentations to department heads to develop weekly sales promotions, store conditioning, labor budgets, and profitability growth opportunities. Prepared pl meetings quarterly for each department to evaluate financial statements. Introduced new methods of merchandising to create a new marketing advantage for the company. Collaborated with each department head each week to developed new merchandising plans for the store's sales promotions with diagrams. Recognized for creativity and salesmanship for many different display contests. Ability to work with and direct employees in a fast pace work environment. Work with the kronos system in preparing and monitoring labor and sales budgets for each department. Summary : Dedicated, dynamic leader with over 6 years experience in leading hospitality and sales teams. Experienced in facilities management, inventory control, P&L, lean management, and conflict resolution. A versatile, results-oriented professional that provides a full range of customer support, hospitality, and sales management services. Ability to assess organizational needs and implement administrative procedures. 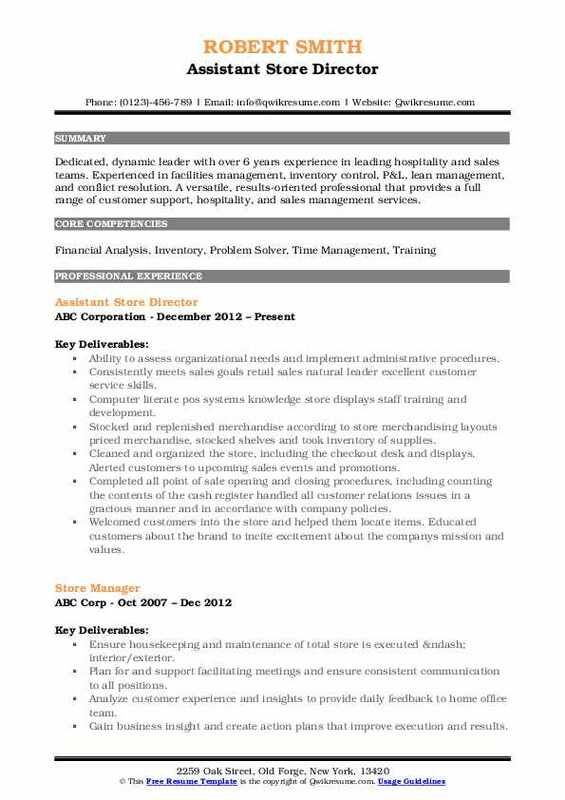 Consistently meets sales goals retail sales natural leader excellent customer service skills. Computer literate pos systems knowledge store displays staff training and development. Stocked and replenished merchandise according to store merchandising layouts priced merchandise, stocked shelves and took inventory of supplies. Cleaned and organized the store, including the checkout desk and displays. Alerted customers to upcoming sales events and promotions. Completed all point of sale opening and closing procedures, including counting the contents of the cash register handled all customer relations issues in a gracious manner and in accordance with company policies. Welcomed customers into the store and helped them locate items. Educated customers about the brand to incite excitement about the company's mission and values. Shared best practices for sales and customer service with other team members to help improve the stores efficiency. Followed merchandising guidelines to present visually appealing displays. Manager with more than 10 years of experience in operations, finance and accounting, budgeting and forecasting, profit and loss, administration, recruiting and staff development, quality assurance, marketing, sales, inventory management, and shipment processing. Increased efficiency, reduced costs, and increased profits through utilization of strong troubleshooting and problem resolution skills while streamlining and determining optimum use of facilities and personnel. 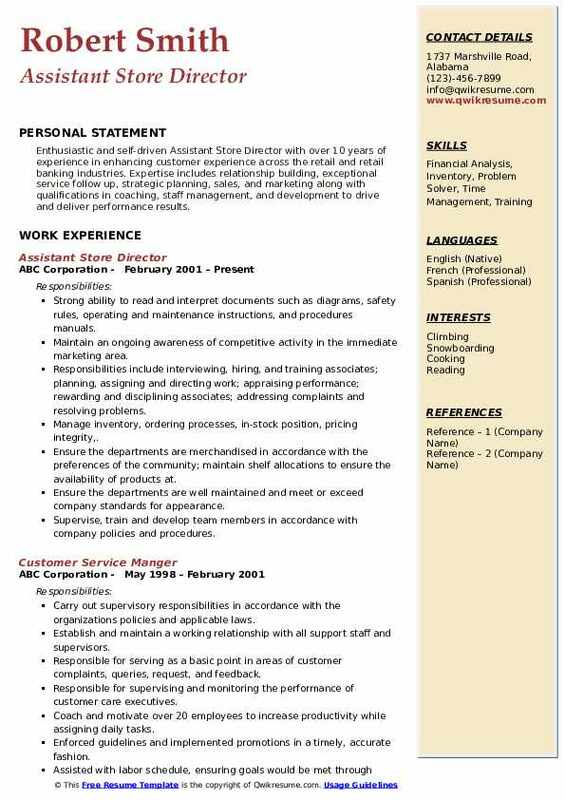 Summary : Enthusiastic and self-driven Assistant Store Director with over 10 years of experience in enhancing customer experience across the retail and retail banking industries. Expertise includes relationship building, exceptional service follow up, strategic planning, sales, and marketing along with qualifications in coaching, staff management, and development to drive and deliver performance results. Strong ability to read and interpret documents such as diagrams, safety rules, operating and maintenance instructions, and procedures manuals. Maintain an ongoing awareness of competitive activity in the immediate marketing area. Responsibilities include interviewing, hiring, and training associates; planning, assigning and directing work; appraising performance; rewarding and disciplining associates; addressing complaints and resolving problems. Manage inventory, ordering processes, in-stock position, pricing integrity,. Ensure the departments are merchandised in accordance with the preferences of the community; maintain shelf allocations to ensure the availability of products at. Ensure the departments are well maintained and meet or exceed company standards for appearance. Responsible for scheduling department team members to meet business needs. Summary : Highly motivated, energetic, and seasoned professional with over 15 years of management experience with a background in Safety Specialist with Safeway INC. Superior interpersonal and analytical skills to accomplish the most difficult of task. A team player with excellent aptitude towards work and new challenges and experienced in dealing with various levels of management. Overall management responsibility for operation in the absence of store director, including store performance, control of cash, inventory and security, customer service, and management of staff. Tracking, analyze and take action to improve store performance by forecasting of weekly /daily sales goals and meeting or exceeding established goals. Forecast, schedule, and monitor labor to be consistent with sales and productivity guidelines and wage budgets; create action plan to address cost control issues. Support store director with development and direction in the execution of strategies to improve product placement and appearance. Ensure that products are displayed and ordered in a manner to maintain in stock conditions. Manage issues relating to store maintenance, cleanliness, safety and sanitation. Oversee and monitor handling of cash and accounting; ensure store is secured. Prioritize, plan, coordinate work activities, and manage time and resources so that work objectives are met. Select, train, develop, and manage job performance of store employees. Preserve positive working relationships with direct reports, peers, supervisors, suppliers, and customers effectively handling complex or difficult situations involving others. Motivate others to perform the job and work towards common objectives. Serve as a role model to others instilling a positive attitude in employees.